3. 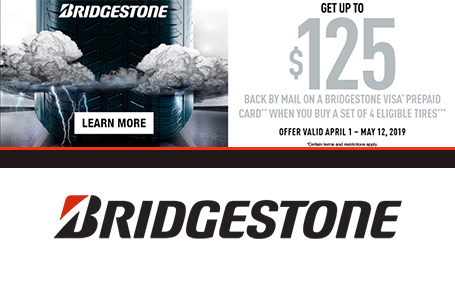 Bridgestone Visa Prepaid Card issued in connection with a promotion program. Card is issued by Peoples Trust Company pursuant to a license from Visa Int. *Trademark of Visa International Service Association and used under license by Peoples Trust Company. No cash access or recurring payments. Card valid for up to 6 months, unused funds forfeit at midnight EST the last day of the month of the valid thru date. Card terms and conditions apply; see MyPrepaidCenter.com/site/visa-univ-can.